Jennifer Halls had written lots of content and worked very hard on her huge website, but she struggled with her Web folks to get everything designed and laid out in a way that felt comfortable. Although there were many components in her site that she loved, she felt it needed more work to be exactly right. However, she was nervous about letting someone redesign things. Jennifer’s site did have a lot of great information, but there was so much going on that visitors were likely disoriented or overloaded while trying to navigate through the site to find what they wanted. She had great industry-related quotes, but they were highlighted and positioned in a way that stole focus from her own content. Her wonderful client quotes, as well, were sadly just lost on the page. First, we knew we could accomplish a lot to improve Jennifer’s website. But, we knew it was important to lay out a roadmap and gently guide her through the implementation, so that it wouldn’t overwhelm her or feel traumatic. Jennifer is an artist, and it was important for her to feel involved and considered with design and layout changes, so we stayed in close communication throughout the project. We took the best design components from the previous design and worked with them in a way that provided a more orderly structure to content. Jennifer loved her compass symbol, but the font used in her logo was much too masculine, and clunky. 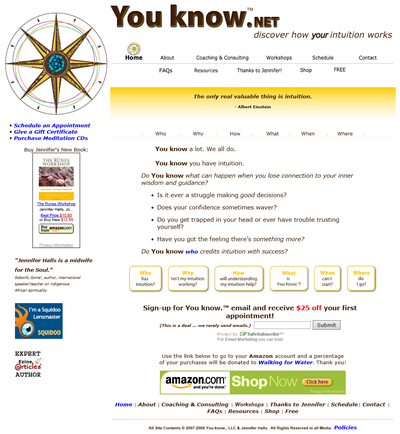 We solved this issue by using a more elegant and feminine font for the “You know” logo. We pulled the yellow background color, that previously highlighted industry quotes, into the top of the header section, so the eye immediately focuses on her logo and the newly positioned client quotes before scanning down the page. We moved the industry quotes down onto the sidebar, adding interest to the page without taking away from Jennifer’s message. We looked at existing content to improve her overall information architecture, and identify the best placement for information and various components, as well as strengthen menus. For example, we pulled more content onto her home page, so that visitors could more readily understand what her business was and what she brought to the table. We combined various sets of small pages to create more interesting section pages. 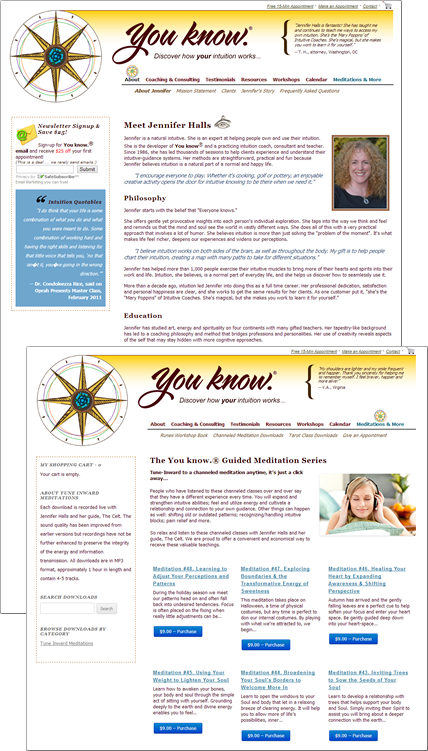 We improved Jennifer’s site in both form and functionality, without radically changing it. Her branding was strengthened and improved; and clients immediately recognized the site even though so much was different.